"Class of 1965 Gift -- Wooden Indian"
The Class of 1965 gift to the University was an antique wooden American Indian statue and was used as a mascot for the Bryant Indians athletic teams. For more information on this wood carving please see the The Archway - November 19, 1971, page 6. In 1994 the Bryant Indians became the Bryant Bulldogs. 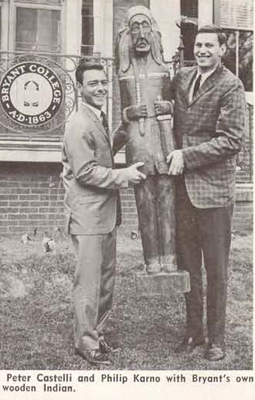 This wooden statue is missing - if you have any information on this historical class gift please contact library@bryant.edu. Thank you!